In the next few weeks you’ll start seeing some pretty exciting stuff being released. They’ll be focused on the most requested features, so make sure to visit the Bidsketch feedback forum to vote! This week I’ve got a completely redesigned content template page which lets you reorder Sections within the template — just drag and drop to set the order. You’ll also see a couple of new items on the dashboard. There’s an “options” link to the right of Recent Proposals which will let you easily filter your proposal list. 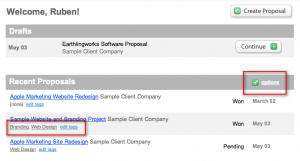 And within your list you’ll notice that proposals can now be tagged for easier organization. Clicking on the “edit tags” link will give you a pretty modal that lets you specify which tags are associated with your proposal by entering a comma separated list of words or phrases. Quick navigation within a proposal on the top right hand column called “Jump To” has been added. Custom logo recommended size is now displayed next to the upload feature. Click on any proposal tag to get a list of proposals by tag. 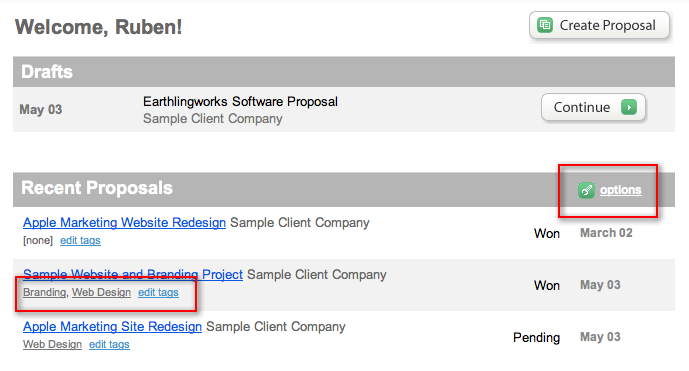 Tags are are included in the proposal search feature. New support button near the top right of the main site navigation for easy submission of support issues. The very next feature update will include: Custom Domains! Be on the lookout for it in the next few weeks. Last but not least, I’d like to thank everyone that gave feedback to make these enhancements possible. More good stuff coming soon!